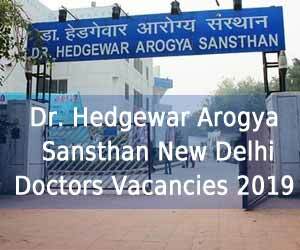 New Delhi: The Dr. Hedgewar Aarogya Sansthan, New Delhi (DHAS New Delhi) released 14 Vacancies for Senior Resident post on Regular Basis. The Selection will be done on the basis of Walk-in-interview. Applications are invited in the prescribed format from eligible candidate to fill up the vacant posts of Senior Resident Doctors on Regular basis in this hospital under the residency scheme as per below schedule. The candidate should report in the Establishment Branch, DHAS Hospital on the day of interview as given below. Registration of the candidates appearing for interviews will be done from 9:30 am to 11:30 am on the date of interview. Though applications are invited for the post of SR on regular basis, in the event of non-availability/non­selection of requisite no. of candidates of requisite categories the candidates shall also be considered for appointment on these posts on ad-hoc basis for a period of 44 days or candidate’s appointment on regular basis whichever is earlier from all the categories of the candidate against the General/Reserved category posts. Therefore the General candidates may also apply for the reserved category and vice versa. Further the application fee for the candidates selected on ad-hoc basis shall be on a refundable basis. Walk-in-interview will be held on 16/4/2019 (Tuesday) at Dr. Hedgewar Arogya Sansthan Kakardooma, Delhi. The Vacancies are in the Department of Anaesthesia, Paediatrics, General Medicine, Surgery, Radiology. MBBS with post graduate Degree/Diploma/DNB in the concerned specialty from a recognized University/ Institution and should have a valid registration with Delhi Medical Council and the candidate must not have completed 03 years Senior Residency in any recognized institution including regular and ad-hoc period. In case of non-availability of PG candidates, minimum 03 years experience in concerned specialty may be considered as per residency scheme. However such candidates will be appointed on ad-hoc basis for 44 days extendable up to 03 years or till the candidate with PG degree/diploma/DNB are available, whichever is earlier. Age: 37 yrs for General (5 yrs relaxable for SC/ST,3 yrs relaxable for OBC and 5 yrs extra relaxable for physically handicapped candidate) as on date of interview. Emoluments: As per under Govt. rules. Note:-The candidates selected on ad-hoc basis against reserved seat/SR on ad-hoc basis will be appointed for a period of 44 days extendable up to a maximum period of 03 years or till the regular candidate joins whichever is earlier. Tenure:- The tenure of senior residents is for a period of 3 yrs including any service rendered as Senior Residents earlier on ad-hoc /regular basis in any recognized institution. The appointment will be initially for 1 yr or on prorata basis that can be extended further up to a maximum period of 3 yrs subject to satisfactory work and conduct report from concerned Incharge and vigilance clearance. 1. Upper age limit for eligibility for SR will be 40 years. 2. In case of non-availability of fresh candidates, the candidates who have completed 3 yrs of senior residency may also be allowed to appear in the interview as fresh candidates. 3. Separate merit list would be prepared for the candidates who have completed their residency of 3 yrs. 4. Firstly the list containing the names of the fresh candidates would be exhausted for the appointment and the second list would be used only after that. 5. All appointment of residents from the second list will be for 01 yr only, it would not be renewable after one year. For appointment against posts reserved for OBC only candidates having the OBC certificate issued by the competent authority of GNCT of Delhi shall be eligible.For SC/ST’s; relevant certificate issued from the judicial revenue authorities as per O.M. NO. 36012/6/88-Estt. (SCT), (SRD. III) Dated 24/04/1990 by the G.I. Dept. of Per. & Trg. shall be accepted. For physically handicapped candidate relaxation is admissible as per Govt of India rules upon submission of Handicapped Certificate from the competent authority. 1. All SR already working on Ad-hoc basis in Dr. Hedgewar Arogya Sansthan need to apply and appear in the interview afresh. 2. The services of SR will be governed by residency schemes of Govt. of India! Civil services (Temporary Rules). 3. Candidates are required to bring all original certificates and testimonials along with two recent passport size photographs on the date of interview. 4. Appointment shall be subject to medical fitness and verification of certificates. Fee Payable for SR post:- Rs. 500/- for general/OBC candidates in the form of Demand Draft/Pay order/deposit in Accounts branch of DHAS, in the favor of Medical Superintendent, Dr. Hedgewar Arogya Sansthan, payable at Delhi. SC/ST candidates are exempted from payment of fee. Submission of application:- Interested candidates may report for registration at 09:30 AM till 11:30 AM in establishment branch with application form along with Demand Draft, photocopies of qualifying certificates, date of birth proof, Photo ID card and address proof. Only those candidates whose registration is completed by 11:30 AM shall be eligible for appearing before interview board. The interviews will be held thereafter. An original certificate must be brought for verification. Note: Competent Authority reserves the right for any amendment, cancellation and changes in the content of the advertisement.